Information seems to be rapidly coming out about the recently announced Kane and Lynch 2: Dog Days. First up is Kotaku with some great news for co-op gamers - the sequel will support online cooperative play through the entire campaign. Also added to enhance the co-op experience will be partner revival with the ability to shoot while down. Another big change for the game deals with going solo, as players find themselves in control of Lynch as the main character. 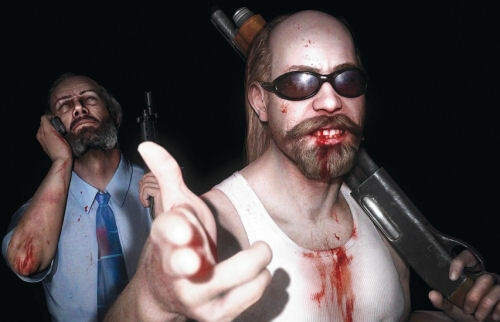 Kane was the lead in the first game, though players that controlled Lynch in co-op found some subtle differences in gameplay style. Hopefully we'll see those things carry over to the sequel. The next issue of the Official PlayStation Magazine has the duo on the cover, and the Eidos forums have put some choice quotes pulled from the article. Sounds like we may be in for a real treat with this one. It may be trying to do some things we haven't seen in games in terms of style. Are Kane and Lynch on the Job for a Third Time? Page created in 0.3199 seconds.